Sacred Scripture begins with the creation of man and woman in the image and likeness of God and concludes with a vision of “the wedding-feast of the Lamb” (Gen 1:26-27; Rev 19:7,9). Scripture speaks throughout of marriage and its “mystery” its institution and the meaning God has given it, its origin and its end, its various realizations throughout the history of salvation, the difficulties arising from sin and its renewal “in the Lord” in the New Covenant of Christ and the Church (1 Cor 7:39; cf. Eph 5:31-32). The intimate community of life and love which constitutes the married state has been established by the Creator and endowed by him with its own proper laws…. God himself is the author of marriage (GS 48 # 1). There are also several pre-marriage courses offered by other agencies. Early booking is essential as courses are in great demand and fill up quickly. 2. Who will perform the wedding? When the bride is from the Parish of St John the Baptist, one of the priests of the parish will be delighted to officiate. Because of the large number of couples from outside our parish who choose to have their Wedding Mass in St. John the Baptist Church, the priests of the parish cannot undertake to celebrate these weddings. Such couples are asked to bring their own priest to officiate at their wedding. Let’s look now at the wedding ceremony. We can put it like this. In the ceremony you meet Christ. As you vow yourselves to each other, and to a life of total fidelity and unbreakable oneness, you give the Sacrament of Marriage to each other. Note that it’s not the priest who marries you. You marry each other. And as you do so, power goes out from that third person present, Jesus Christ, touching you, giving you grace to love each other, to remain faithful, to surmount crises together, to overcome temptations, to bear with each other, to forgive each other. The bond that comes into being between you when you marry is a permanent sacrament, a sign for us of how Christ loves us by the way you love one another. What you must do is live out this new relationship as fully as you can, all your days. What the wedding ceremony promises is that Christ will remain with you so that your marriage may be lived in love. Make an appointment to meet with any Civil Registrar to give at least three months notice of your intention to marry in advance of your proposed date of marriage. In preparation for the meeting with the Registrar meet with your local priest, book your church and know the name of the priest who has agreed to celebrate your marriage (he is known in civil law as the Solemniser). Make sure the priest who has agreed to marry you is on the ‘List of Solemnisers’. If he is not on the list ask your local priest about having him nominated as a Temporary Solemniser of your marriage. If either of you has been previously married you must provide the Civil Registrar with an original divorce decree or death certificate if widowed. Make sure you receive the Marriage Registration Form (MRF) from the Registrar and show it to the Solemniser who has agreed to marry you to ensure all the details are correct. Make a verbal declaration of no civil impediment. This declaration should be made not more than two days before the wedding in the presence of the two witnesses and the solemniser. It is recommended practice that this declaration be made at the beginning of the wedding, when the bride and groom arrive at the sanctuary. This declaration can be put at the beginning of your wedding Mass booklet. NB: You must return to any Civil Registrar’s office the signed MRF/Form A no later than one month after your marriage has been celebrated. Pre-Nuptial Enquiry Forms need to be completed within 6 months of the date of your marriage. This is done by the priest of your parish in your presence. A Document known as a ‘Letter of Freedom’ from any parish other than your home parish in which you have lived for more than six months since reaching the minimum age for marriage. For Parishioners there is no charge for the use of the Church. Again the offering to one of the priests of the parish is a private matter. The offering to the Sacristan is €50 which is given to him/her on the day of your wedding. If you are marrying a non-baptised person or a member of another Christian Church you will have to seek a dispensation form the Archbishop. Your priest will discuss this with you. The priest of your parish will provide you with the pre-nuptial enquiry form. To avoid disappointment, we would be grateful if you could ensure that your marriage papers arrive at The Presbytery, 186 Clontarf Road, Dublin 3 at least one month before the date of your marriage. Please try to give the Priests in your own Parish at least three months notice of your marriage because it is they who are responsible for preparing you for marriage and it is they who complete the Pre-Nuptial Enquiry Form with you. You may discover that longer notice will be necessary if you are living outside Ireland, as your papers have to be channelled through your own Bishop as well as through the Archbishop of Dublin. Music: Music will add to the joyful atmosphere of your wedding. Be sure, however, that the music is suitable, respecting the sacred character of the occasion. In recent years certain types of love song have been creeping into wedding s which, although perfectly suitable at the reception afterwards, are not suitable in the church. Music of this kind takes from the occasion. Remember the music is there to glorify God, to add beauty and joy to the marriage, and to help you and your guests to celebrate what you are doing in a prayerful and loving way. Flowers: The use of flowers and plants, if arranged in good taste can heighten the joyous festive spirit of the marriage ceremony. Photographs:If you are engaging a photographer or a videographer, choose the kind who do their work quietly and with minimum distraction. Make sure that they consult beforehand the priest in charge. Arriving on Time: Out of courtesy to the Bridegroom, Guests, Priests, Sacristan and all who are involved we would ask you to arrive on time. Confetti:We would ask you to refrain from throwing confetti or rice in the church grounds. Offerings to the Church: For non parishioners the offering is €350 for the use of the Church. This will need to be given to the Parish Office on booking the Church to secure your place. An additional €50 is given to the Sacristan on the day of your wedding. The offering to your own priest is a private matter separate from the Church Offering. 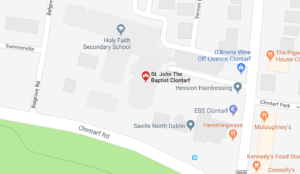 Copyright - St. John The Baptist, Clontarf - Hosted by GetOnline Pro LTD.